January is national soup month. 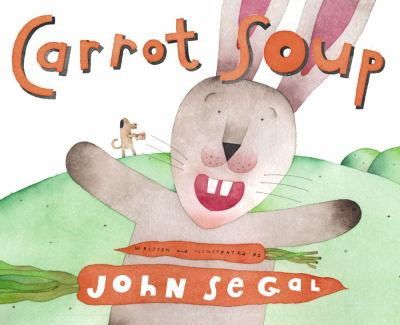 In honor of that, the younger girls (ages 4 and 5) and I, have been reading a number of soup themed picture books. Several of which, have recipes for soup, at the back of the book. I love children's books with recipes at the back, don't you? 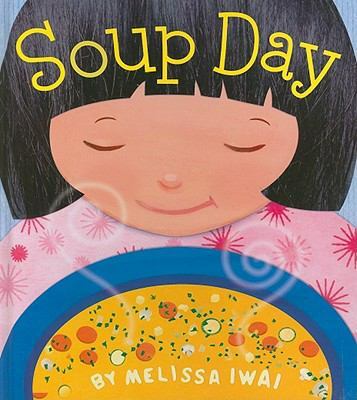 Soup Day, by Melissa Iwai. A simply written, crisply illustrated story of a little girl, and her mother. Following them from the store, to the kitchen, as they wash, chop, and mix up a steamy pot of Alphabet Soup. The soup looks so good, and the girls wanted to make some right away, even though I know they'd never eat it, if we did. They were less tempted by the recipe for carrot soup, at the back of John Segal's Carrot Soup. Though, they enjoyed the story of a rabbit frantically searching for his missing carrots, while his friend's sneak them away from the garden, in the background, to prepare their own surprise. 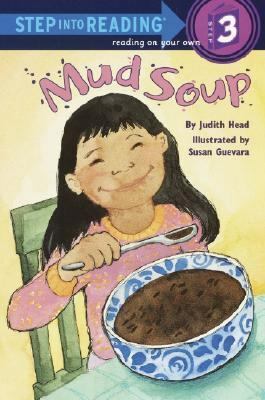 Mud Soup by Judith Head is a sweetly told story of cultural misunderstandings. When Rosa offers Josh some of her abuela's homemade mud soup, he doesn't think it's really mud, but he's just not sure. Is that a bean, or a beetle floating on the top? The recipe at the back assures the reader with an "MMM. Yummy! Delicioso!" Just in case there's any doubt left. 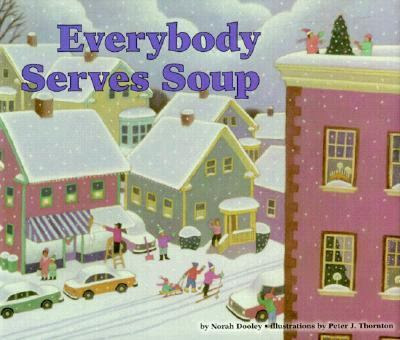 Of course, it wouldn't seem right to mention soup themed picture books, with recipes included, without adding Norah Dooley's Everybody Serves Soup, to the list. The story, about a girl shoveling snow, and collecting soup recipes from around her neighborhood (really from around the world), might be a little long for younger children. But, it has seven recipes for soup, from Puerto Rican Chuleton to Southern Corn Chowder. None of my children are great fans of soup. So, I figured, if they were most likely going to reject it, no matter what recipe we tried, we might as well be daring, and try out a recipe from George Washington Carver's How to Grow the Peanut, and 105 Ways of Preparing it for Human Consumption. This is Science Sunday, after all, and George Washington Carver is one of our favorite scientists. So, for our story time snack, last night, we (mainly I) whipped up a pot of Peanut Bisque. You can find the recipe, which combines boiled milk, chopped onion, salt, pepper, flour, and peanut butter, by clicking the link above. But, let me assure you, it tastes as bad as it sounds. E, claimed to like it. And, she did manage to keep down three bites - two more, than the rest of us. It's not just, that it tastes bad. Actually, the taste might be alright, in a peanuty sort of way. But, the color, kind of a sickly yellow, and the grainy texture, mix together with the odd combination of smells of peanut butter, and onion, in a very unappetizing manner. We still think quite a lot of George Washington Carver, and all of his scientific accomplishments. But, when it comes to the science of cooking, I think we'll stick with Alton Brown. For more fun with science, check out this week's Science Sunday link-up, at Adventures in Mommydom. Or, click the links below, to find more children's book reviews, and recommendations, from Mouse Grows, Mouse Learns' "What My Child Is Reading" blog hop. National soup month? I had no idea! Fantastic book choices. Our kids love Mud Soup! Oh, you are kidding! We LOVE peanut soup. We first got it in Willamsbug, VA and fell in love with it. I am not sure if it is the same recipe, but it is very popular in Colonial South. But then, we are soup fans in general. There is a book "Everyone Eats Rice" in the same format as "Everyone Serves Soup" you might like. It also talks about the different cultural ways people fix rice dishes. Phyllis - Yes, I'm sure regional taste plays into our not caring of the soup. And, our more modern sense of seasoning. I certainly saw some sweet potato, and peanut soups at allrecipes.com, that look pretty good. Soup month...gotta love that! I need to get those books and maybe K can choose a soup of the month. Don't forget to read Stone Soup!! One of my favorites! Soup + Science = Fun! This post is so funny. No one in my house would eat that peanut soup. I had no idea about national soup month. I love soup. Oh, and I too adore children's books with recipes in them!!! I have had to come back and read this a few times now, to give myself time to think about the peanut soup. It just doesn't sound appetizing, even without your description. The books sound like great hits though! Fantastic. I love soup and now that thanks to Acorn I have someone willing to share soup with me I am making more. I think we will have to add both Mud Soup and Everybody Serves Soup to our reading list for this week. I suspect our choice of new recipes to try won't be anywhere near as adventurous as yours though. I have never tasted peanut soup and this post didn't make me any closer to trying. I love certain soups, but unfortunately, daughter is not a big fan. Still, we usually make soup once a week, and this post made me want to try something new. I have to look for a couple of books in this post. We made the veggie soup in Soup Day. It is yummy! Lots of fun especially if you have alphabet pasta.